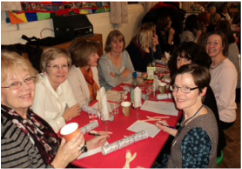 On Monday 16th December we held our annual Christmas party and what a fabulous night we had. Traditionally this is a ticket only event which includes a welcome drink, quiz, hot meal, a raffle and a Secret Santa. Upon arrival, member were treated to a warming drink of mulled cider and to prepare us for the quiz, there was a brainteaser awaiting us on each table. There was a slight delay, caused by the urn breaking down, and then we split into teams! Silence descended on the room as Darren, our quizmaster, challenged, teased and tormented us with six rounds of questions. Half way through the evening, we broke off for food and what a feast we had. Dee, our very own catering committee member, served up lamb tagine and chicken casserole with various accompaniments, followed by a selection of mouth-watering desserts. Then back to the quiz and eventually, as we lingered over coffee and chocolates, the winners were announced. There was a vote of thanks for all the helpers and then we drew the raffle.Twenty one lucky ladies went home with a lovely festive hamper, with all items having been donated by members of the WI. Finally, the members left with a gift from the Secret Santa. What a great way to begin the Christmas festivities! What a memorable night our AGM and Sconathon turned out to be! With a record attendance of over 80 ladies, after the usual notices, the evening commenced with the AGM. Sarah, in her role of secretary, gave us her end of year talk in which she highlighted many of the events that have taken place over the last twelve months, which illustrated just what an eventful and varied year we have all enjoyed. This was followed by Tracy, who gave us a brief overview of the annual finances and attendances statistics. She explained how we try and put money into member activities and this is why we have a deficit this year as planned. Up to September this year, the average attendance of members has been 54% and this has increased over the last 2 months and we have 23 members who have attended every meeting this year. Hilly, as outgoing President, then gave the last key talk of the evening which was both entertaining and emotional. She told us what great fun she has had during her time as President with so many different activities ranging from canoeing, cycling, walking, the new book club, orienteering, theatre trips and a camping weekend. She then amused us with several personal anecdotes as well as explaining how she has tried to develop Fulshaw as a friendly group of ladies open to new starters who don’t know anyone and hoped that this will continue. She thanked the committee and membership and hoped that we would all give the same support to Wendy, our new President. Hilly then handed over to Wendy who introduced Lorna Davy to explain the rules of the Sconathon. Every member was given two voting slips, one to vote for their favourite savoury scone and the other for their favourite sweet scone. Everyone was then given the opportunity to look at and taste all the scones before placing their votes. After the Sconathon and tea, Wendy gave a short talk about her own experience of joining Fulshaw and thanked everyone who had made her so welcome. She then presented Hilly, Sarah and Tracy each with a photo album entitled Memories of Fulshaw WI and a personalised cross stitch card. Check out our recipe section for the recipes for the award winning scones!! Helen Yates gave us an informative presentation about the origins and development of the organization known as “Incredible Edible”. Although this is both a national and international movement, the local story begins in 2010 when Helen was watching a Countryfile programme about Todmorden and this inspired her to try to emulate some of their good practice in Wilmslow. From small beginnings Helen explained the current model as three spinning plates involving community, business and learning and she outlined the growth in the involvement of individuals, schools, supermarkets, shops and the town council. Many members will be familiar with the various plots, previously unloved but now full of herbs, fruit and vegetables outside Waitrose, the Library, Bank Square, Costa and the Station. They will have also seen the schools’ planters outside Hoopers. Hopefully they also pick and use the crops grown as these are meant for sharing by all. “Incredible Edible” aims to reconnect adults and children with what is in season and what to do with the food when it is harvested. They support and improve a local economy, based around food, improving the look of the town, boosting community spirit and identity and sharing the knowledge of growing, cooking and sourcing local food. Eleven members enjoyed listening to Jenni Murray talking to Sheila Hancock about her early life and career and her new novel which has just been published. Bad luck for our own Sheila who didn’t manage to get to the Royal Exchange due to a cycling accident and now has a broken collarbone. We wish her a swift recovery. Wendy talked to Sheila Hancock after the show, managing to get her to write a dedication to the “Ladies of Fulshaw WI” in one of her books. Sheila commented that her mum was in the W.I. and said it was “a great institution”. Having more members than the trade unions, the W.I. was very instrumental in getting things done. Although Wendy said there was a long queue of people, Sheila was not only very willing to talk, but listened to problems and seemed genuinely interested in people’s thoughts. A lovely lady, a great inspiration and yet another enjoyable afternoon organised by Wendy. So on October 8th, fifteen of us passed the security checks to enter Media City and now we are familiar with the workings of Radio 6, Match of the Day, Breakfast TV, the Weather Reports and all the sound effects from Radio 4 plays and drama! Who would have known that Gary Lineker sits under lights worth two million pounds or that they have so many flats containing different door closures for authentic sounds during The Archers? And we also enjoyed a lovely meal at Penelope’s Kitchen. Thank you to Jane Rawlings for yet another enjoyable day out. Despite a large turnout of fifty seven ladies, there seemed to be plenty of room to circulate around the tables which were awash with every type of bead imaginable. With lots of chattering and laughter, members made some beautiful jewellery including necklaces, bracelets, earrings, bookmarks, mobile phone charms and even dust plugs! This was a return visit by popular demand for the team from Beady Beady and a very enjoyable practical session with everyone demonstrating their creative flair. Some people got so engrossed they even missed their tea and cake but they all went home either proudly wearing or carrying their creations in the little organza bags provided. A great event to begin our Autumn season. WOW, WHAT A TURN OUT!! On Tuesday evening, 30 eager walkers met in the Merlin pub car park. We were delighted to welcome husbands, children and dogs! Jane, as always, did a marvellous job with her map reading and everyone enjoyed finding new paths and trails to explore. Adults chatted, the children played and after having walked for around 2 hours, we finished back at the Merlin pub where a welcome drink was enjoyed by all. Thanks to everyone that came along and an especially big thanks to Jane for organising it. On July 24th, eighteen members travelled by tram, train, bike or bus to meet up at 10.45 am for a tour around the Royal Exchange in St Anne’s Square, Manchester. We learned about the history of this Grade 2 listed building from the first construction in 1729 and it’s trading in spun yarn and finished goods throughout the world including Africa. We were then taken into the ground floor of the theatre where we were told about the formation of the present theatre in 1976 and the damage caused by the IRA bomb in June 1996. It was reopened in 1998. The theatre “in the round” currently contains the set for the production of “Around the World in Eighty Days”. We then went “backstage” to visit the areas of sound production, hair and make-up and costumes. Most people were amazed to hear that even famous actors and actresses were given the same shared dressing rooms with rather basic bunk beds to use between performances. Questions continued to be asked and answered during the tea of assorted sandwiches, scones, jam and cream. Another very enjoyable event, this time organised by Wendy Morris. We were delighted to welcome back Jane Shepherd again and she did not disappoint. She entertained us with tales of her own and her friends dating experiences, using the internet as well as good old-fashioned ‘snail mail’! She began by telling us about when, over 10 years ago, she first ‘dipped her toe’ into this world by using a lonely hearts column. This involved going through a telephone process and after receiving a phone bill of over £75, this was an option she quickly stopped using.She then told us about specialist papers that are available such as the Pink Paper, aimed at the gay market. A close friend of hers and senior figure in the media world, using this paper, sent off his profile and several months later, having forgotten what he had written, saw it advertised and ended up writing to himself for a date! !When internet dating came along, Jane entered into this scene, filling out questionnaires to get the correct ‘match’ but all this seemed to prove was that there were no suitable men in the North West as potential dates lived in places as far away as Kent and Glasgow.Many internet dating sites developed such as The Guardian, full of very earnest people who liked to yomp up mountains and ‘mysinglefriend’ (founded by Sarah Beeney), who write your profile for you. But again, Jane found these sites did not produce men in the North West as they are both London-biased.Experience taught Jane some of the jargon used and how to read between the lines. LTR = long term relationship which usually means someone looking for a ONS = one night stand. She saw examples of 60+ year old men, stipulating they were looking for women around 30 years old with an age range and sometimes even a required weight range stipulated!! Jane listed some of the things she wasn’t looking for in a man which includes silly hats, facial hair and the use of bad grammar. She told us she had written back to men giving them feedback about the latter point and had offered tips for making contact with others in the future. A handy hint she offered was always to talk to someone on the phone before you agree to meet. If you can watch TV, read a book and file your nails whilst listening to them on the phone and still be bored, then don’t bother going on a date. As an experienced internet dater, Jane has found that there is safety in numbers and it best to play men at their own game by keeping a few ‘on the boil’ and letting them know about one another. She told us that photos can be deceptive. She met a man once with black hair on his photo but who had yellow hair in reality. When no photo at all is shown on a profile, it is usually a good indicator that they are married! Then there are the con men. Jane went out with a very nice, but young guy from Cameroon who was well aware of their age difference before they met. They met several times despite his comments about the fact he could do with a new car and his sister him to send her money. The final straw came when, despite being in Spain, he phoned and asked whether she would write a letter confirming that he was her boyfriend and that he was going to live with her!! Despite all these tales of woe, Jane entertained us all in her own inimitable style and was pleased to tell us that she had several friends who had met men through the internet and are now happily married. Whoever would have thought that a 20 mile round trip to Tatton could have so few inclines. Six members enjoyed this ride and the weather held while we ate in the Gardener’s Cottage Restaurant. Thank you to Jane Rawlings for arranging the ride. On Thursday 3rd July, 20 of us enjoyed a great evening at Giuliano Restaurant in Handforth. The evening commenced with a glass of Prosecco and we then progressed onto a beautiful 3 course meal, with plenty of choice offered for each course and each served with a specially selected wine, all followed by coffee. After the main course, some ladies moved round the table to make sure we all got to meet different people and make new friends. After dessert, we joined into teams to take part in Hilly’s Italian-themed quiz. Not the easiest quiz in the world (! ), but we had great fun guessing the answers and Italian prizes were awarded to the winning team. Everyone that attended the evening thoroughly enjoyed it and will be sure to return in the not too distant future. Three of our members went camping and enjoyed crash courses on jam making, papercutting, vintage headscarves, face drawing, landscape photography and various crafty projects. There were about 250 members who had come from all over the country. Brilliant atmosphere and companionship. Hopefully the event will be repeated next year and more people will be able to go. WI members were inspired, educated and entertained by the June speaker Zoe McClean. Zoe is a demonstrator working for Sainsburys and she delivered over an hour of cooking tips and anecdotes. The first recipe she demonstrated was a simple leek and salmon risotto. Zoe wanted to dispel the myth that risotto is difficult to cook because it has to be very precise. We learnt not to crush the garlic but to chop it so that the flavour was less likely to cause bad breath. Zoe recommended the most cost effective smoked salmon to use for this dish was the Sainsburys essential range salmon trimmings. The recipe was simple, easy to make and very tasty. While the risotto cooked Zoe made a cream cheese and smoked salmon spread which she used to generously cover a wrap. After topping it with rocket, she rolled it like a swiss roll and then cut it into small pinwheels to create elegant canapes. A second canape was created from toasted baguette rounds topped with mascapone cheese, pesto, antipasta (tomatoes, peppers and mushroom) and a basil leaf. As she worked Zoe described how she started as a shelf stacker in Sainsburys when her children were very young but her catering expertise was soon spotted and eventually led her to a job as a demonstrator. When Jamie Oliver was “Feeding the Family for a Fiver” Zoe appeared on several Sainsburys adverts with the man himself. She described him as very down to earth and friendly. Another part of the job she enjoyed were weekly cooking lessons in the X Factor House. The first year Sainsburys arranged this saw Zoe and her colleagues teaching Jedward and Ollie Muirs how to cook. The next year was even more exciting because she got to work with the boys from One Direction! The audience had the chance to taste all the dishes that Zoe prepared. They were very popular but the best was yet to come. An enormous bowl of Eton Mess was assembled from strawberries, raspberries, cream, creme fraiche, zest of lime, chopped mint and meringue. The whole evening was a great success and it seems likely that Wilmslow Sainsburys had a run of essential smoked salmon trimmings the next day! Our organiser for this event, Kate Bryant, commented: “A big thank you to all the 13 ladies who joined us for the orienteering on Wednesday and threw themselves into it with such great enthusiasm and even greater energy!! All of the 6 teams went for the longer of the two options (120 minutes rather than 90) and achieved an impressive level of success in locating the correct control points and answering the questions. I didn’t expect anyone to get them all within two hours, but Julie P very nearly managed it, with Tine and Aukje hot on her heels! Everyone arrived back at the pub in a very happy mood, and fell to discussing their routes – looking for all the world like real orienteers! Many thanks to Jane and Steve Rawlings, Dave and Steph Bryant for helping with the planning, and/or on the evening .” Thank you to Kate too!!! If you couldn’t come and would like to have a go or if you enjoyed it so much you can’t wait until the WI organise another one, Manchester & District Orienteering Club organise “Countryside Score” Events around the area which have a similar format being based on a pub, and using enlarged OS maps. The next one is on June 25th at Sutton. Website www.mdoc.org.uk Alternatively there is a “Colour Coded” event (courses for all abilities using a specially drawn orienteering map) taking place at Teggs Nose on June 19th. All are welcome at these events. See www.mdoc.org.uk for further details. Our talk by “Quinteassential” was extremely popular and extra chairs had to be put out to cope with the large number of members and visitors. Sitting around tables we tasted a range of teas blended by this small independent company which was established in Cheshire in 2010. The first was a caffeine free tea known as “Jewel of Africa” which is given to children and is said to have very positive health benefits. Next came a white tea which retains antioxidents and is said to break up fat tissue. Some members certainly pricked their ears up at the thought of that! The “Green Flamingo” tea flavoured with the exotic fruit graviola reminded several members of jelly beans! The “Imperial Earl Grey” was iced and can be served with ice-cream and finally came a signature breakfast tea. Advice was given about making the perfect cup of tea. 1. The first cardinal rule of brewing great tea is to use good quality tea leaves. 2. When it comes to water temperature, remember – the blacker the tea, the hotter the water. Placing a small amount of hot water in the teapot first to warm it is always good, but be sure to discard that water before adding the leaves and final water. 3. Store your tea properly, keep it away from odours, heat, moisture and light. 4.Use the right equipment .Loose leaf tea is incredibly easy to prepare and can be a very rewarding experience as its a better quality than most teabags. If you are using a traditional teapot without an infuser, use a tea strainer to separate the leaves from the liquor. Use different styles of teapot for different types of tea. 5. Timing is everything when it comes to brewing the perfect cup. Each type of leaf has an optimum brewing time and under brewing and over brewing can both ruin even the best teas. The general rule here is the more fermented the leaves, the more brewing time. Hence, white tea, 1 to 1.5 mins; green tea, 1 to 2 mins; oolongs 2 to 3 mins and black teas 3 to 4 mins. 6. Use freshly drawn water. We were also warned against drinking black tea after noon and using sugar! Discussion arose about putting the milk in first to avoid cracking bone china cups. Quinteassential currently sell ten blends of their tea online plus limited edition blends and tea accessories. A fantastic day! We built two dens, wamped (you’ll have to ask someone who went to find out about that! ), made dreamcatchers and listened to an entertaining story about the history of bling in Alderley Edge. Then there was the food – toasted marshmallows, crumpets and teacakes. We have decided that some of us missed out on all the activities our children now do – we are catching up! Our April meeting was entitled 'Boosting Confidence through Clothes' and was a talk given by Sally Inkster. Sally impressed us all initially with her great appearance and bubbly personality and then continued to impress us as she gave us lots of ideas about what we should and shouldn't wear to make the most of what nature has given us! What to wear is a problem that most of us worry about nearly very day and Sally started off by explaining that the answer is all a question of balance. Our bodies aren't naturally balanced so we have to use tricks to make them appear that they are. Whether we achieve this or not can have a great impact on us psychologically so it is important to get it right. Clothes tell people what and who we are and by the same token, we judge other people accordingly by how they look. The fashion industry is a huge and lucrative market, out to maximise sales and therefore we need to know our own body shape so we can buy wisely. This can be done by measuring the distance between our shoulder bones and the distance between our hip bones and then comparing them to find which is bigger. If your shoulders are bigger then you shouldn't accentuate them so don't wear puffed sleeves, shoulder pads, slash necks, tightly fitting jacket sleeves or cap sleeves. Attention should be brought to the hips by the use of pockets on skirts and trousers or wearing skirts that flare out. Ladies with hips larger than their shoulders are said to have a Mediterranean body and as such should accentuate their shoulders by wearing puffed sleeves, big lapels and no detail on their hips, keeping to tight plain fabrics for trousers and skirts. Where shoulders and hips measure the same, three different waistlines may be evident - tiny, going in slightly or expanding. If you have a waist then show it off, if not, create one! This can be achieved by wearing tailored clothes, one-buttoned jackets, long necklaces coming in at the middle - all designed to create a 'V'. Lengthwise, for a balanced body, the crotch should be midway between the feet and the head but 75% of ladies have short legs. Tips to make legs look longer include wearing trousers long enough to hide your shoes and socks, shoes and trousers should all be the same colour. Long cardigans and jackets which make the upper torso look longer should be avoided, so wear short jackets, especially when wearing flat shoes. Never put a horizontal line over something you don't like eg. don't wear a short jacket if you have a waist larger than you would like. When wearing a skirt or a dress, there are two lengths that look good, either floor length or from the knee upwards and the shorter the skirt, the lower the heel you should wear with it. The longer the skirt, the shorter any jacket you are wearing can be. Accessories can make or break an outfit and once again it's all to do with balance. The taller and larger your bone structure, the more dramatic your accessories can be. Accessories can take the form of pattern, texture, jewellery or a bust greater than C+. But, you should only wear two of these at a time. Colour is the last consideration when choosing what to wear. Anyone can wear any colour but it is the shade that is important. Choose your lipstick by checking with your eye colour - it will be obvious what suits you, and the same principle applies when choosing which colours to wear. Hold various coloured garments against your face and see how it can enhance your appearance or drain your natural colour. By the end of Sally's talk we couldn't wait to get home to check out our wardrobes and then head off to the shops the next day armed with a wealth of new knowledge! Several members are now far more familiar with the workings and shortcuts available on their iPads after an evening’s tuition from Diane “the IT angel”. It was definitely worth braving the elements on the windiest night of the year and the coconut flapjack was divine! Eight members enjoyed an Italian meal at Fina followed by a showing of “The Railway Man” at Cinemac on Thursday 23rd January. It is hoped to arrange similar events. Please let the Committee know if there is a film you would particularly like to see.